blooms of the season. Most gardeners use bulbs to get early color in the garden and fill the gap until the forsythia make the first dramatic contribution to the garden in mid April (here in Massachusetts). Wouldn’t it be great to start the show earlier this year? If you’re lucky enough to have some witch hazel (hamamelis) in your garden, then you’ve already enjoyed a late winter treat. (See our post on hamamelis). Hamamelis is one great way to bring early color into the garden. Another great (and tragically underused) early spring bloomer is rhododendron mucronulatum. Also known as Korean Rhododendron, this deciduous rhododendron flowers around the same time as forsythia (early April in Massachusetts) and puts on an amazing show for two solid weeks when very little else is blooming. 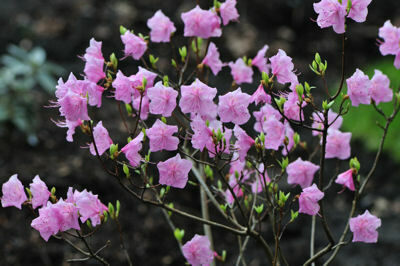 Korean Rhododendron is only hard to find because it blooms before most nurseries open, so most won’t sell it. It’s very easy to grow and blooms reliably. What makes this plant extra special among rhododendron and azaleas is that it blooms before the leaves come out (remember it’s deciduous!). This gives it a delicate cloud-like appearance while in bloom. One of the best (and most available) cultivars is the clear pink “Cornell Pink”. This is a relatively large shrub that gets to 6 feet tall and wide. 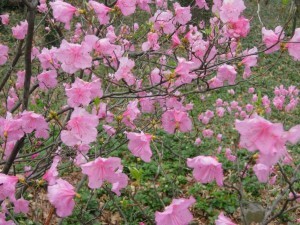 It flowers profusely on bare branches in early April dominating the early spring garden. You’re guaranteed to get passersby stopping and asking about it. Like other early bloomers, the trick is to find a nursery that carries it and also is open before it blooms (if you want to appreciate the blooms the first year). Growing rhododendron mucronulatum is relatively easy. It likes sun, but doesn’t like intense heat. This translates to a lightly shaded area for gardeners in my zone (zone 6). More shade would be needed farther south and full sun more north and near the coast. It’s not a fast grower, but even small plants will put on a good show. “Cornell Pink” is hardy to zone 4. 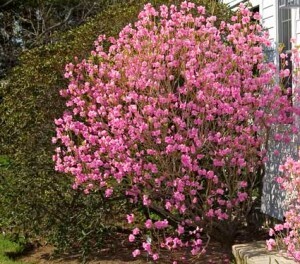 Cornell Pink is a great way to bring spring to your garden a little earlier. Start looking for one now so you can enjoy the show this year! This entry was posted in Gardening, Shrubs. Bookmark the permalink.